Mission style furniture has been a popular choice for American homeowners since the late 19th century, undoubtedly because of its traditional elegance that never goes out of style. Mission kitchen hutches feature straight angles and flat planes which give the furniture a unique, classic look. 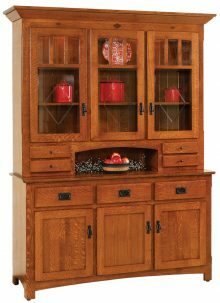 A solid wood Mission Hutch from AmishOutletStore.com will bring the simple yet striking Mission design to your dining room. And with dozens of beautiful Mission-style hutches to choose from, you’ll have no problem finding the one that is perfect for your dining room décor! The same can’t be said when you order from a standard retailer catalog. Choices are usually limited to a few different colors and finishes. If you’re trying to match your hutch to other furniture you already have in your dining room, it can be a challenge. With solid wood furniture, the natural grain pattern variation is a bonus. It highlights the unique nature of each and every piece. Man-made veneers and finishes can try to mimic solid wood, but they never compare to the real thing. We also have many different sizes of Mission-style kitchen hutches to offer you. From spacious units with tons of storage for large rooms to compact models that don’t take up much space for smaller rooms, we have the variety you need. In all cases, you’re getting the style and elegance of traditional Amish Mission design combined with the durability and strength of solid wood construction. And this isn’t just any wood — it’s northern kiln-dried wood chosen for its natural beauty and unique wood grain. Unlike mass producers, we don’t force you to buy standard catalog hutches. We give you a choice in the wood. You might like oak, maple or cherry, some of our more popular woods. You can easily select the wood of your choice from a drop-down menu in our catalog. You also get to choose the stain from over a dozen different colors. Why constrain yourself to a handful of big box store choices when you can really have fun and customize your Mission hutch the way you want? Our Mission hutches are made from the finest hardwoods including Oak, Cherry and Q.S White Oak. 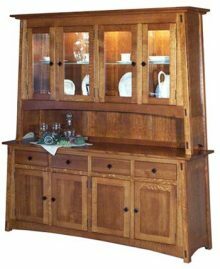 Amish master crafters make each hutch as if it were intended for use in their own home. Choose from a wide variety of stunning stain colors such as Seely, Black Walnut, Acres and many more. A solid wood Amish Mission hutch isn’t just for storing — it’s also for displaying. Use your Mission hutch to showcase your fine china and collectibles. 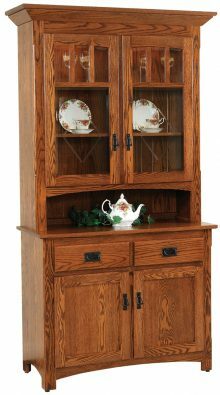 The hutch itself is a work of art and deserves a prominent place in your dining room. It will most likely turn out to be the crowning feature in your dining room, and it will catch the eye of anyone who enters. You can even add flowers or rustic decorations to bring out the natural beauty of your wood Mission kitchen hutch. You can customize your Amish Mission hutch right here, from the comfort of your own home. Ready to get started? Take a few minutes to browse our complete Mission Hutch inventory, and use the convenient design tool to experiment with different woods and stains. Let your imagination be your guide! Compare different models to your existing dining room table and chairs to find a hutch that matches, or go for a complete, new dining set right here at AmishOutletStore.com. If you order today, we can offer as much as a 33% price reduction. On top of those great savings, we can also offer additional savings on large orders, or if you pay by check. Get started now, or give us a call if you have any questions, and we’ll be happy to create the perfect Amish Mission dining hutch along with you!